The idyllic accommodation Oasis is the perfect place for individualists, who want to enjoy their holiday in a central, but quiet location. Located in the direct vicinity of the bungalows are two of the most beautiful beaches on La Gomera. The popular beaches Playa de la Calera and Playa del Ingles are only a few minutes’ walk away. To the delight of our guests, we have many tropical fruits and plants in our complex. Visitors will find mangos, papayas, avocados and many cacti. 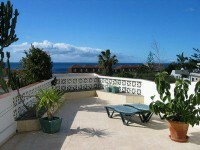 Fabulous views over the sea, mountains and palm trees can be enjoyed. Guests cannot help it but to forget their worries and enjoy a relaxing time with us. Large sun and shaded terraces invite you to relax. Each of our holiday apartments has its very own unique atmosphere and was individually designed. 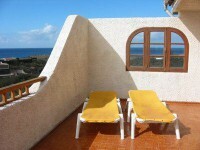 The apartments are designed in the typical Canarian style an is built in such a way, that they are very private. All of the holiday homes have ample bedding and towels for our guests. We do request that you bring your own beach towels however. The reception is opened Monday to Friday from 5pm to 8pm and Saturday from 11am to 2pm.